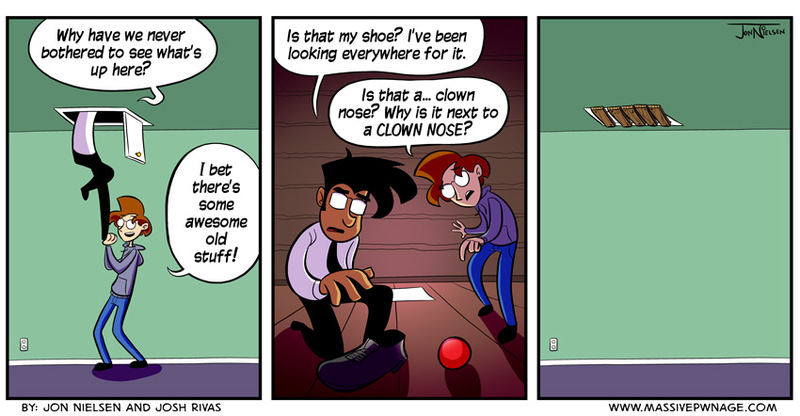 Horrible places to find a mysterious clown nose: attic, basement, under your bed, under your pillow, on top of your pillow, toilet seat, lunch box, on the welcome mat at your front door. This entry was posted on Friday, June 29th, 2012 at 12:00 am and is filed under Comics. You can follow any responses to this entry through the RSS 2.0 feed. Both comments and pings are currently closed. That’s so damn creepy, man. I would definitely seal off that attic too… clown’s are one of the scariest creatures to exist on our planet… Which makes me wonder how an alien would react to seeing a clown for the first time? Hmm…maybe I misinterpreted the comic. I thought an evil clown (sans nose) sealed them in the attic while they were up there. Funniest thing ever! Clowns are bad!